What better way to honor our courageous ancestors than by throwing a feast pinoy-style? Make sure that the classic Chicken Inasal is part of the menu. Best eaten with heaps of freshly cooked rice and atsara! Yum! 1. In a mixing bowl, marinate chicken with garlic, lemon grass, vinegar, sugar, freshly cracked pepper, salt and calamansi juice. 2. Set or leave chicken for at least an hour. 3. Prepare atsuete oil in a Chef's Classics sauce pan. Simply add the atsuete seed in the oil, then heat the oil and stir. Turn off the heat and add garlic lastly. 4. Strain the seeds and set aside. Let the oil cool. 5. 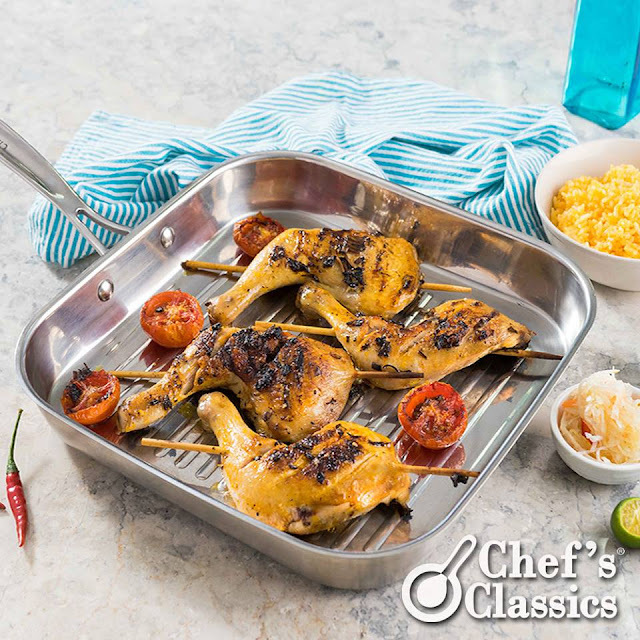 Set a Chef's Classics Fennel Grill Pan over low to medium heat. Grill the marinated chicken. 6. Brush chicken with atsuete oil occasionally. 7. Grill chicken for at least 4 minutes each side or until it is cooked.